Now that the Olympics are just about over (great work, everyone), it’s time for the real games to begin! The Paralympics are the international sporting event held together with the Olympics. It’s a chance for athletes with various physical disabilities to go head-to-head with the top para-athletes in the world! Don’t be mistaken, these are real tough players. While their disabilities range from mobility disabilities and amputations, blindness, to cerebral palsy, these folks don’t let it slow them down one bit. Take a look at this video and you’ll see what kind of highly skilled, devoted and driven athletes you can expect to see! There are approximately 4,200 atheletes competing in 21 different sports. And Oceania isn’t missing out! Nine Oceanic nations are competing: Australia, Fiji, Solomon Islands, Vanuatu, New Caledonia, New Zealand, Papua New Guinea, Samoa and Tonga. This is the first time in history that the Solomon Islands are competing in the Paralympic Games. Vanuatu will be sending four atheletes. Marcel Houssimoli will compete in the 100m, 200m and 400m athletics categories, while three others will compete in judo and table tennis. I recommend this great interview with Fijian sprinter Lusiana Rogoimuri! 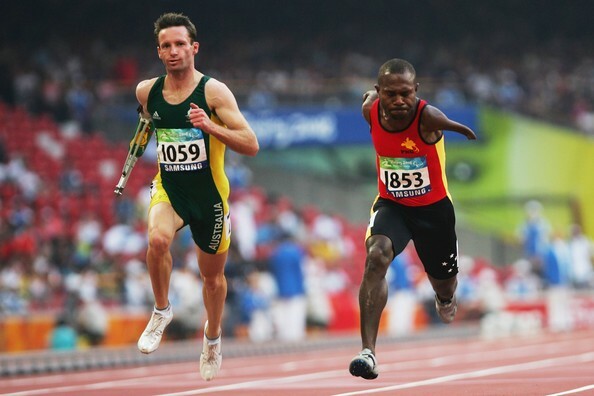 In 2008, at the previous Paralympics Games held in Beijing, China, Francis Kompaon became the first Papua New Guinean to win a metal at the Games — in either a Paralympics or Olympic event! He ran the 100-metre sprint in just 11.10 seconds — five hundredths of a second behind Australia‘s Heath Francis. For this, Kompaon received not only the Silver Medal, but the chance to carry the Olympic torch during the relay through Beijing. What an honour! He makes PNG proud. The Paralympic Games run from August 29 – September 9 in London, England. You won’t want to miss it! Learn more about the Oceania Paralympic atheletes at oceaniaparalympic.org.